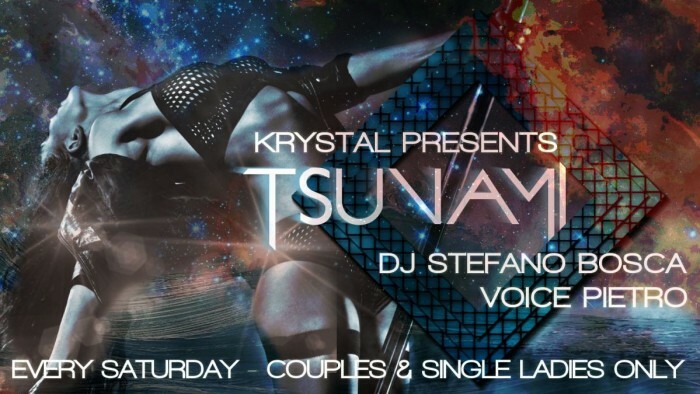 TSUNAMI is the name of the Saturday night at KRYSTAL, the name of the party which made us famous, our trademark. Every Saturday Night at KRYSTAL is a “couples and single ladies only” Event. No single gentlemen allowed, for this also we are different. Approach KRYSTAL with a degree of enthusiasm, charge with positive energy, and lose yourselves in a magic night! Let our crew take you by the hands and get ready to meet new friends. Stefano Bosca and Pietro from Radio Company will hit you with their famous “wall of sound”, as no swingers club can beat Krystal’s DJ booth! Enjoy our buffet, and the international cocktails of our bartenders. Enjoy the company of many couples who want to share your same fun.